The causes and consequences of milk spoilage may differ across various geographic regions.Thus we decided to carry out a global survey on milk spoilage to study people’s opinions and concerns about it and their interest on the need for an immediate solution.We accomplished it by creating survey forms and sending it to different parts of the globe by collaborating with various international iGEM teams.Here are the results of our analysis. Responses were obtained from a multitude of countries including Spain, Mexico, Somalia, Zimbabwe, Pakistan, Britannia, Ireland, Britain and Venezuela. 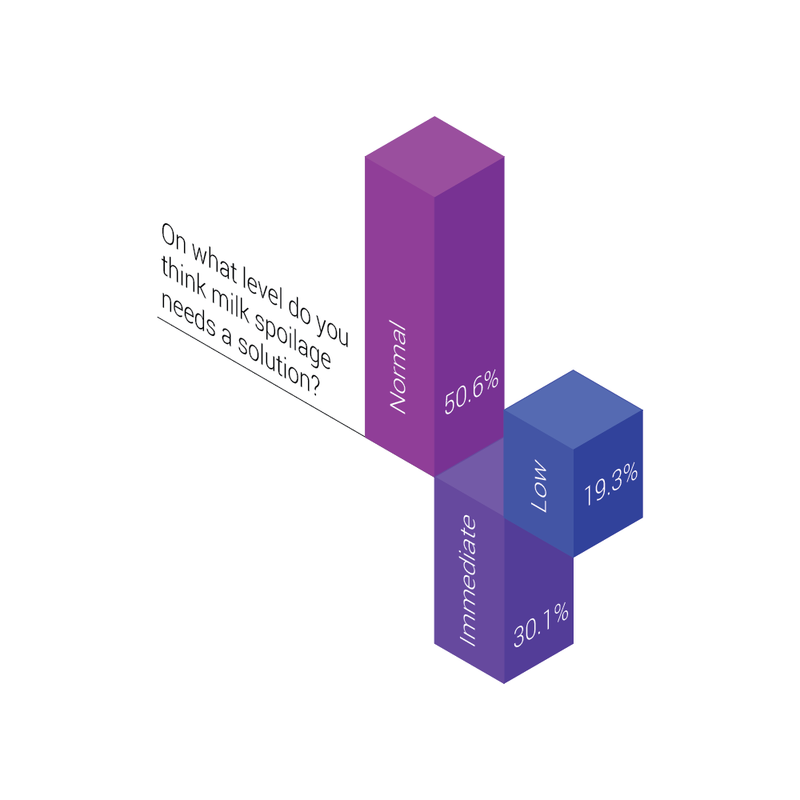 About 65.09% of the responses was from the people of age <25.This infers that the younger generation(particularly the student community) is mostly concerned about this issue and have addressed it well. From the responses it was clearly evident that more than about 50% of the people irrespective of their regions, consider milk as an important part of their daily diet. 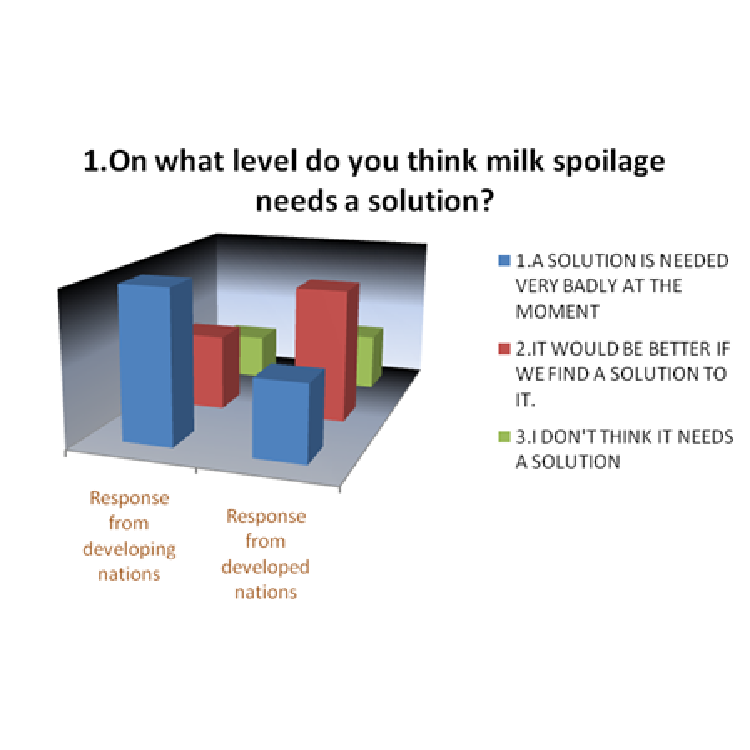 A majority of the population favor the development of an immediate solution for milk spoilage and a part of them even feel that it’s indispensable. These responses supported our cause well and motivated us to enhance our project. 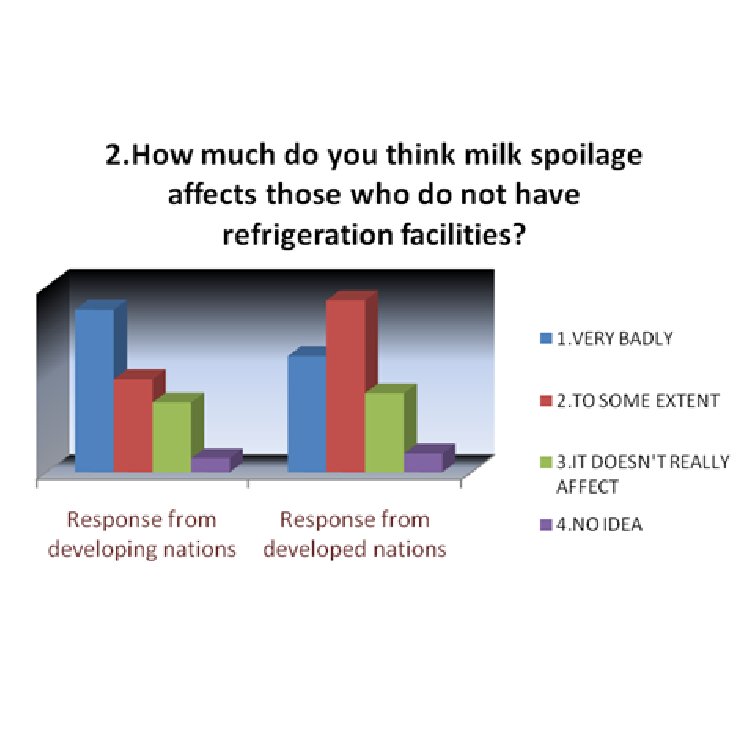 When asked about the consequences of undesired spoilage of milk on the people who can’t afford for refrigeration facilities, more than about 65% of the people responded telling that the effects are adverse and is to be agonized. Although most of the assenters belongs to the student community and are of young age, they are as well concerned about using GMOs in food. Perhaps, they were ready to use it if they were assured about it’s safety levels. This showed us that we need to be more concerned about the safe handling and disposing methods of our product. When questioned about the use of our AMPs in milk and it’s consumption, about 3/4th of them replied positively conveying that they’ll definitely use it on approval by the respective regulatory body in their country. (for e.g. FSSAI is the regulatory body for approving the use of GMOs in food). This gave us a positive boost to deliver our product in the most safest way possible. The above inferences were based on the reponses from people of different continents including Asia, Africa, Europe, South America, and North America. The best part is that we gained replies also from some significant developing nations such as Pakistan, Zimbabwe and Somalia. We thought that it would be better if we could compare the opinions of people from developed and developing countries on the same prescribed issue and we did it through the means of graphs which we have depicted below. The above graphs showcase the opinions and views of people from different parts of the world on a same concerned issue. In order to get an enhanced view of this, we decided to compare and contrast the summary of responses obtained from both the developing and developed nations for some chosen set of questions. By doing so, we have concluded the analysis by segregating the acquired responses into the following four category and hence comparing people’s views on the same. From the graph it is evident that the developing countries are mostly worried about the issue of milk spoilage and it’s consequences. Whereas the developed countries aren’t much influenced by the issue and hence do not require an immediate solution. This serves as a means to support our project which mainly targets the poor community. The graph clearly depicts that the developing countries which have a majority of rural population is adversely affected by the issue and have replied stating that the intensity of the issue is very immense in their region.These recurrent losses inturn affects the economic status the country which is still more worse.However the developed nations aren’t much afraid of the consequences as they already have economic stability and are able to develop and afford for supplements to milk such as milk powder, etc as an integral part of their daily diet. 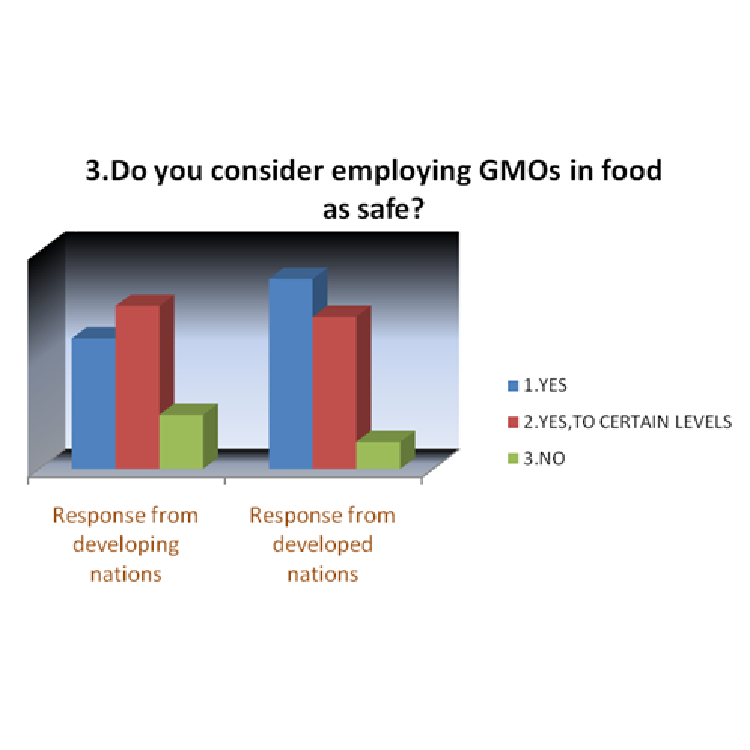 The people belonging to developed countries seem to be ardent supporters of GMOs as they have replied confidently giving a “Yes”.However, there are also a significant number of people who are concerned about the safety of the marketed GMO. 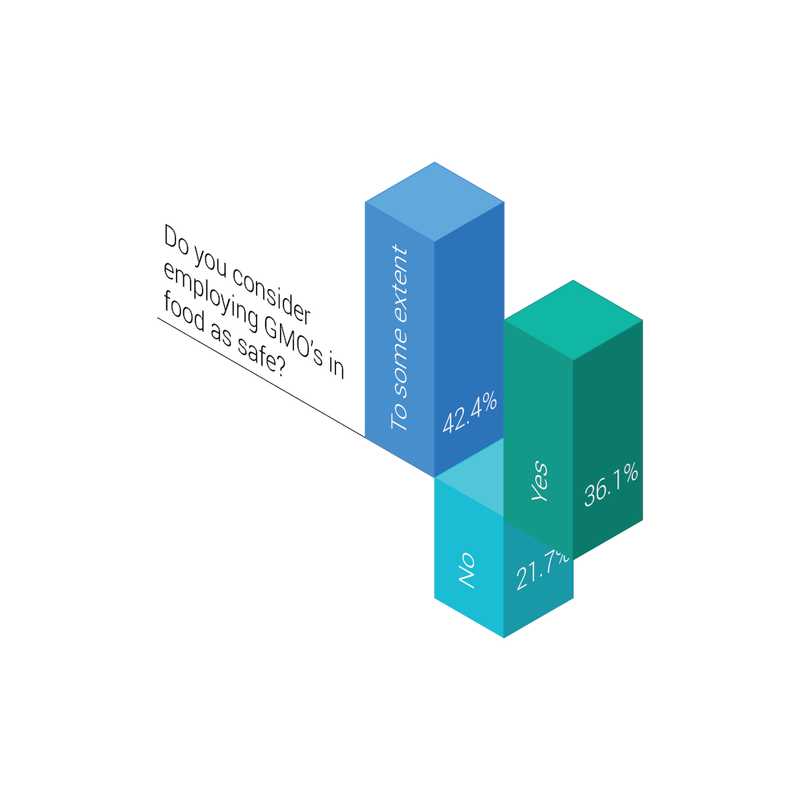 On the other hand, masses from the developing countries still hesitate to accept the use of GMOs in food completely, although some of them seemed to support it.This ensures that the people are mostly worried about the quality and safety of the food they consume. Thus it is necessitates our team to work more on the safety of our product. 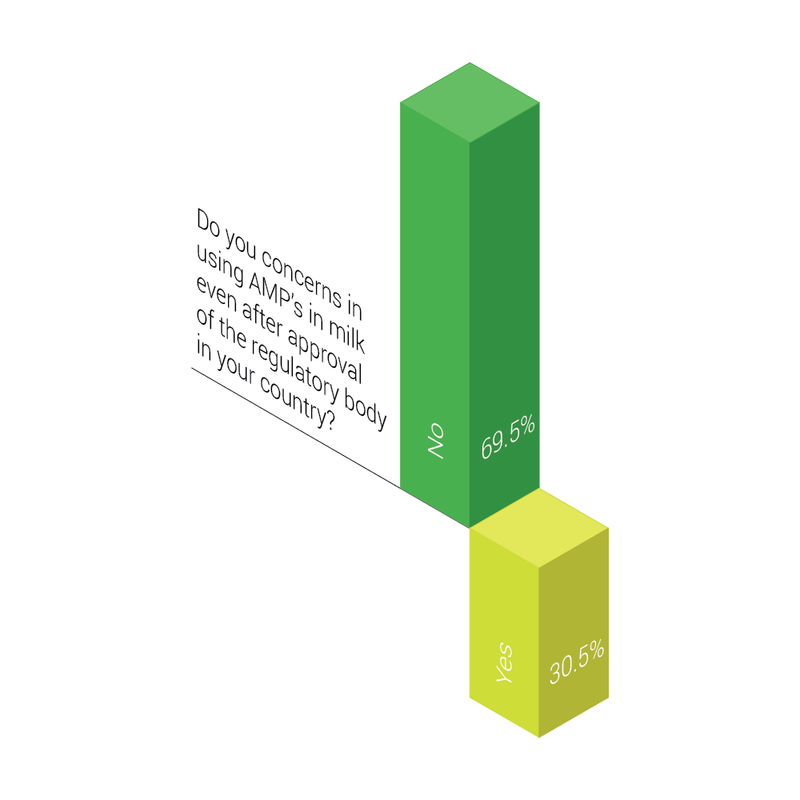 While this question was put forward, about 3/4th of the population from both the developing and developed nations replies positively conveying that they’ll definitely use our AMPs if it’s being approved by the respective regulatory bodies in their countries.This encouraged us to enhance our work further and to assure it’s safety levels. Irrespective of the region to which they belong to, the people are concerned more about the issue of milk spoilage and they feel that the development of an immediate solution is indispensable. They are as well bothered about the safety of the GMOs being used in food and are ready to consume it only if it’s assured of it’s quality and safety. Most of them are worried about the poor population who can’t even afford for refrigeration and saw our project as a potential boon for them. From the comparative analysis it is ensured that the use of AMPs is being supported by the people of both the developed and developing population nations.